I don’t use curtains in my bedroom; I don’t need them – someone would have to climb over our 8 foot fences and face our “attack cat,” Malky in order to see inside my bedroom… and we all know that would pretty much ruin any possibility for us to be friends. Instead, I use half shutters, which allow me to see the moon at night and the birds during the day. It’s my favorite space in my house. So peaceful. Anyway, the other morning I cracked open my eyes to discover the entire room was glowing orange; it felt like a giant hug. An absurdly bright hug. Rather like this mango. “It’s 8 am,” I thought, noticing the height of the sun in the sky, pleased that I had slept that long. I glanced over to the clock out of habit. That’s when I read the shocking truth: it was only 6:30 a.m.
Friends, the dazzling array of sunlight is eager these days. I’ll be honest. I temporarily reconsidered my position on curtains. But then a bird flew onto a branch nearby and sang me a song. 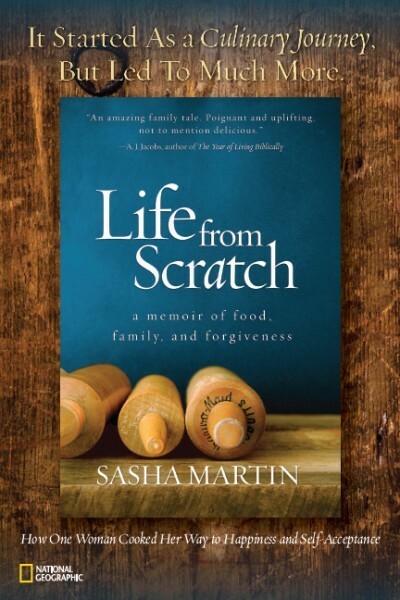 As I listened to her sweet chirping, I realized I could never go back to a dark bedroom and being shut in. There’s nothing to be done but to embrace the early morning glow. Since Taiwan is rumored to be mostly cloudy, most of the time, I thought I’d create a bowlful of sunshine for you. 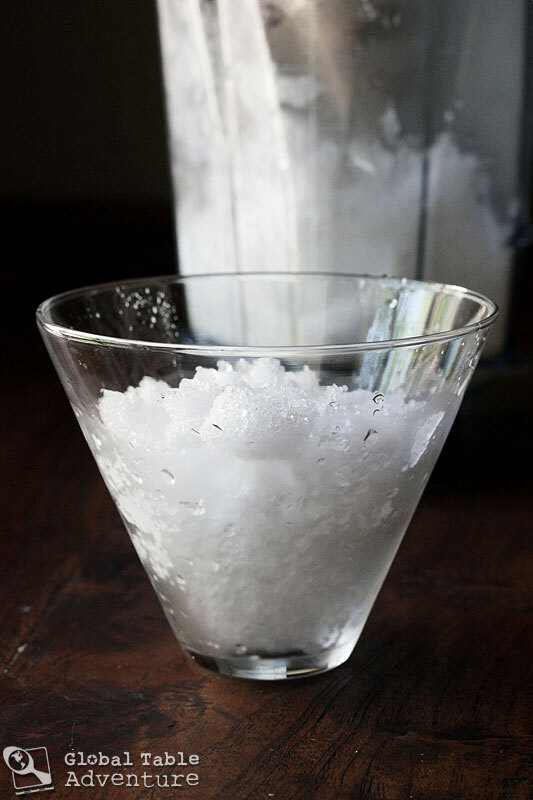 Bào Bīng is like an Asian snow cone, but better. You’ll find it sold by street vendors in Taiwan, but can easily be made at home in under ten minutes. 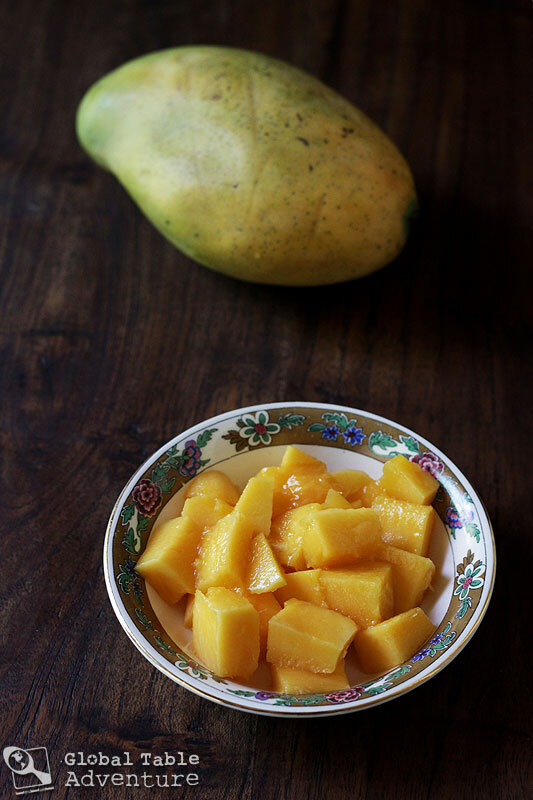 It’s cold, sweet, and refreshing, especially when made with a bright, glowing mango. The one constant is finely crushed ice. 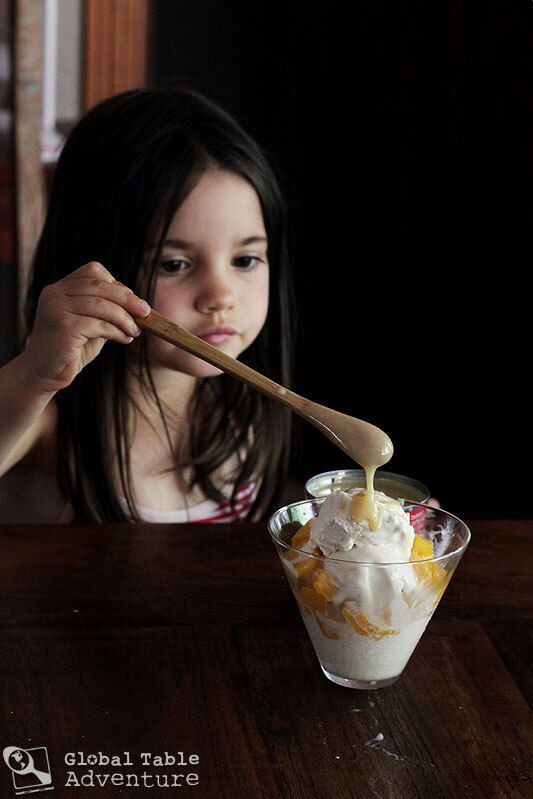 Toppings can range from simple syrup, evaporated milk, condensed milk, fresh fruit, red beans, or even ice cream. Popular fruits include mango, pineapple, strawberries, and watermelon. Various pre-set combinations also exist, including “Eight Treasure Ice” (Chinese: 八寶冰; pinyin: bābǎobīng) whose ingredients will vary from vendor to vendor, but usually include some of the following: taro, azuki beans, mung beans, yams, sweetened peanuts, almond junket, and grass jelly. These ingredients can also be ordered separately as the customer desires. If you can buy crushed ice, great. Otherwise, just pop a couple of handfuls in the blender and let it crush up on low speed until it forms a fine snow (or as close as you can get). 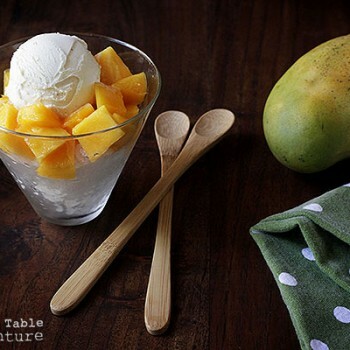 Next, add the mango and the ice cream. I used vanilla, which gave the treat a lovely creaminess, but pineapple or mango sherbet would be grand as well. 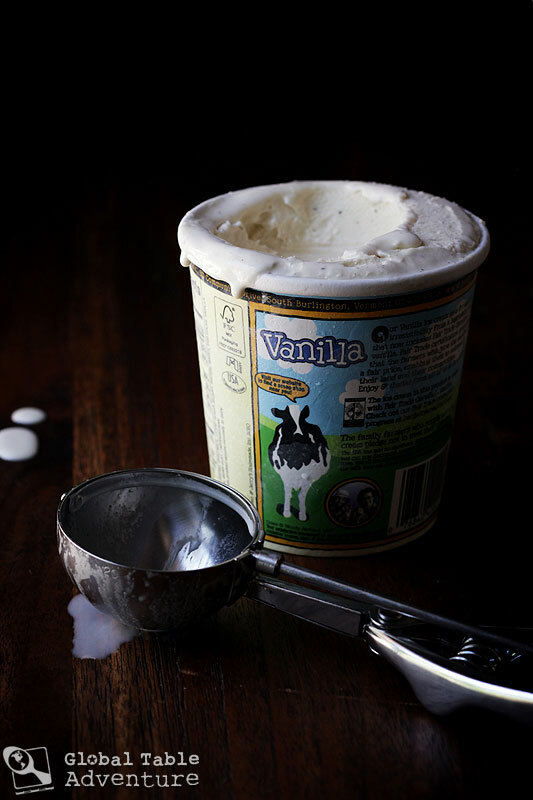 Next, pour on the sweetened condensed milk… which gives the treat a cooked, faintly caramel profile. Plus it’s fun to drizzle. 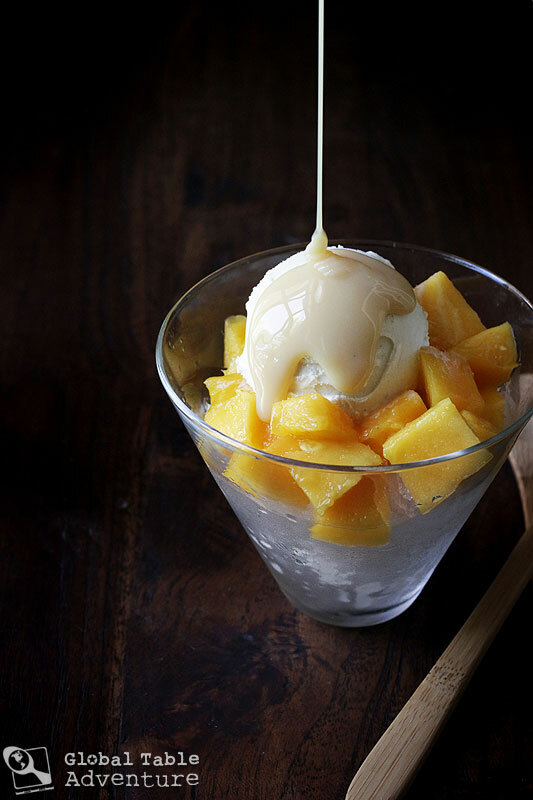 The ice cream and sweetened condensed milk melts into the ice and makes for a soft yet crunchy combination… Edible sunshine! Perhaps you can enjoy it on the next cloudy day you encounter. 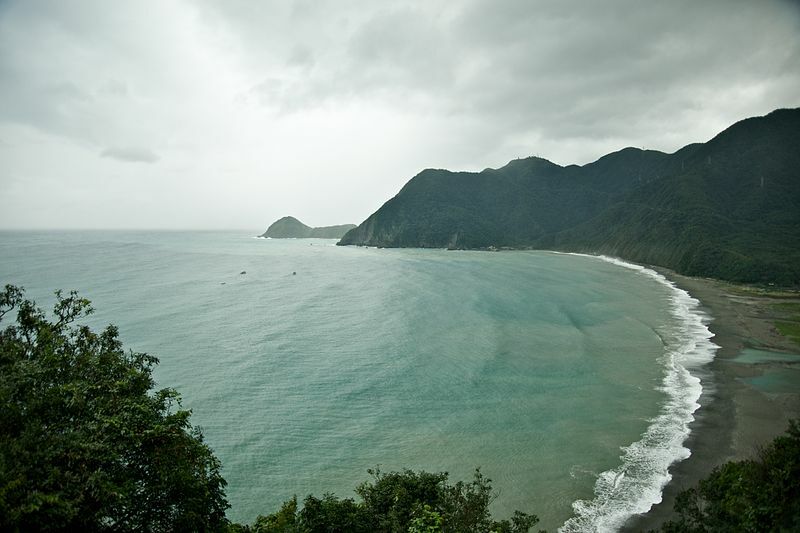 WuShihBi Cape seen behind the DongAo Bay, from the SuHua Highway, a scenic drive on the east coast of Taiwan. Photo by Fred Hsu. Have you tried anything like this? Do you think you’d like it with beans or peanuts, or is that too much of a stretch for you? 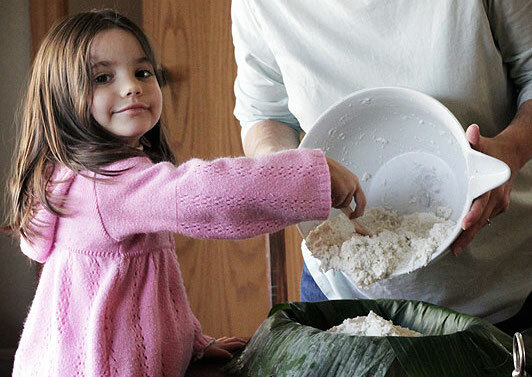 Do you see yourself making Bào Bīng? 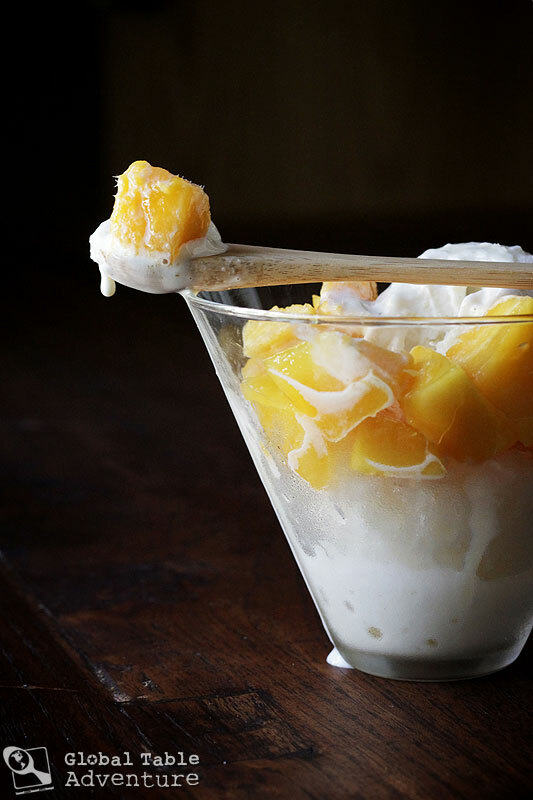 Bào Bīng is like an Asian snow cone, but better. You’ll find it sold by street vendors in Taiwan, but can easily be made at home in under ten minutes. 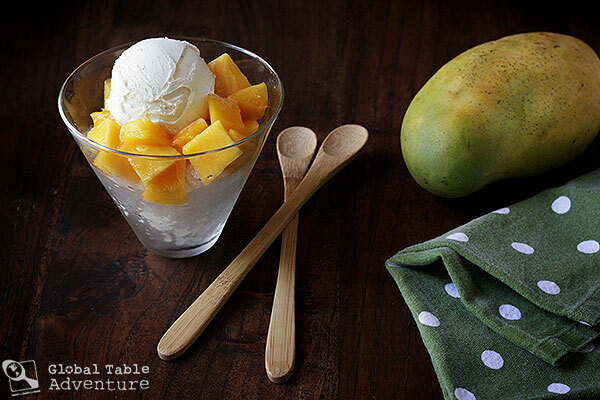 It’s cold, sweet, and refreshing, especially when made with a bright, glowing mango. The one constant is finely crushed ice. 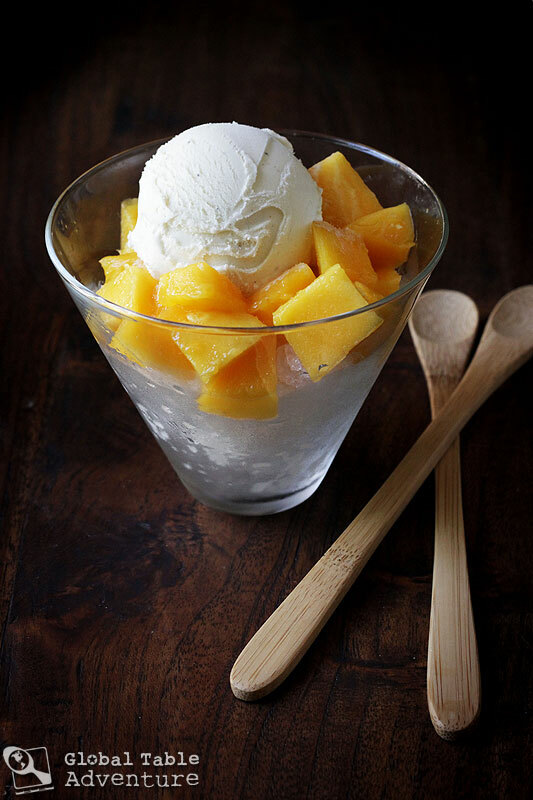 Toppings can range from simple syrup, evaporated milk, condensed milk, fresh fruit, red beans, or even ice cream. Popular fruits include mango, pineapple, strawberries, and watermelon. Next, pour on the sweetened condensed milk… which gives the treat a cooked, faintly caramel profile. Plus it’s fun to drizzle. Enjoy. Iced Kakang is sold by street vendors in some areas of Jakarta, Indonesia. I had it often as a teenager when visited my father. On the Shaved Ice, since I’m not a fan of grass jelly. I liked either unripe palm nuts( 1st choice), sweet and gelatinous sold in jars or cans in sugar syrup or almond and milk jelly( if available homemade), agar agar, sugar, canned cows milk or soy milk and almond essence, topped with either mango or fresh pineapple. On Summer days in Jakarta so hot with such high humidity, you didn’t want to eat much especially in the heat of the middle of the day a little fruit or Iced Kakang, which was heaven! I remember I didn’t feel like eating a full meal till an hr. or two after the sun went down in the evening and it cooled off a little. Then the food stalls and tiny local restaurants would fill up each with a specialty. The craziest thing I ever ate in Jakarta in of these tiny local restaurants was Chinese Bar-B-Qued (Char Sui) Fruit Bat Wing . ( Locally eaten the same as chicken wings but much bigger, fruit bats have a large wing span ) with dryer hotter sauce. I remember it as chewy and quite hot, but tasty.Though I only ate one Fruit bat wing. Mostly not to insult the restaurant owner whom my father knew well. Fruit bats have a large wing span. Thousands would fly around at dusk or right after. So there were plenty of them free or very cheap food source for the poorer kampongs. Added note to above: as far as I remember locals would only eat the Fruit bat wing only not the fruit bat meat. Prepare it carefully and I’m not sure of all the steps but the wing might have been boiled first, then soaked in homemade Char Sui marinade, and finally grilled over charcoal on a wire rack on both sides of the wing till very done.Sorry to Vegetarian and Vegans out there. Remember bats can carry rabies don’t try this at home. 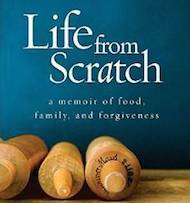 And there might have been other procedures in the cooking locally to make it safer to eat. I’ve heard of fruit bat soup, too… interesting! Never tried fruit bat soup. What country did that soup originate from ? Here’s a song to play as you eat your bao bing. It’s by Taiwanese singer Teresa Teng. She was so popular in China, where her music was banned, that people said “the Communist Party rules China by day, but Teresa Teng rules it by night” when foreign radio stations could be covertly listened to. Thank you, Brian… I’ll be listening from New Jersey. Yum I had this before.